How a satire website Faking News’s video and an article by Firstpost became fodder for social media rumour mongering. 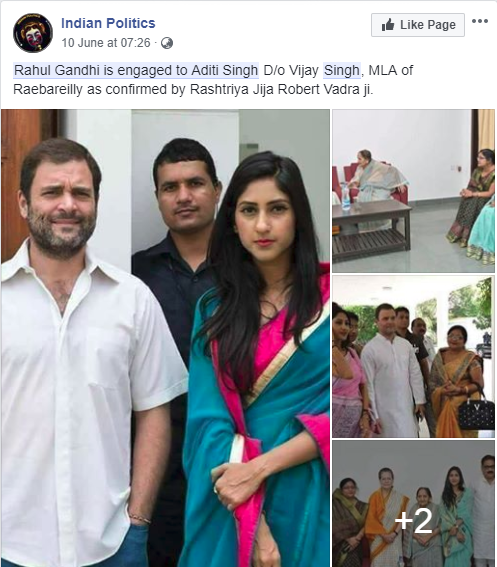 Four photos are being widely shared on social media with the claim that Congress President Rahul Gandhi has got engaged and Robert Vadra, his brother-in-law has confirmed the same. We got these photos on our BOOM helpline (770090611), asking us if the news is true. However, this news has been denied by the lady herself who is being linked with Gandhi. She is Aditi Singh, a Congress MLA from Uttar Pradesh’s Rae Bareli. In a tweet dated May 6, 2018, she said that Gandhi is her rakhi brother and is saddened by these rumours. The news of Rahul Gandhi’s engagement seems to have originated from a Firstpost article which is being shared along with these photos. A screenshot of an excerpt from the article gives an exclusive quote from Robert Vadra, ‘Yes its true. All speculation over his marriage will finally end. Rahulji will get married later this year and I am serious.’ However, the article does not mention Congress MLA Aditi Singh. 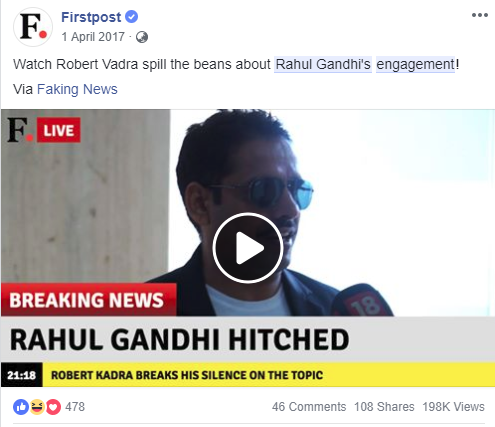 The excerpt is from Firstpost’s April 1, 2017 article titled, ‘Watch: Rahul Gandhi engaged, Robert Vadra spills the beans’. 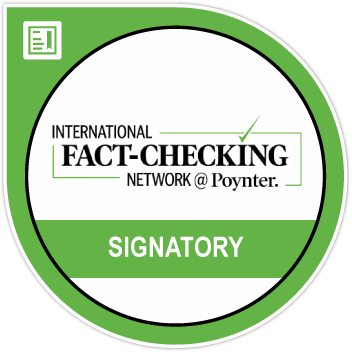 The article also has a note at the end which says, Brought to you by Faking News. 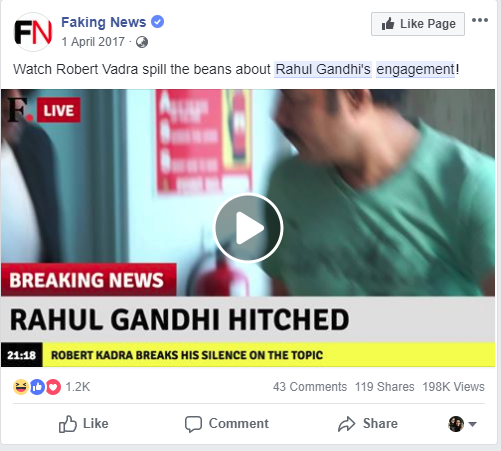 Though BOOM could not find the same article on Faking News website, a different one titled, ‘Robert Kadra speaks about Rahul Gandhi’s marriage’ by Santosh Pradhan dated April 12, 2018 was found on their website. Both Firstpost and Faking News posted this video on their Facebook pages on April 1, 2017 which shows that this was a prank on April Fool’s day. 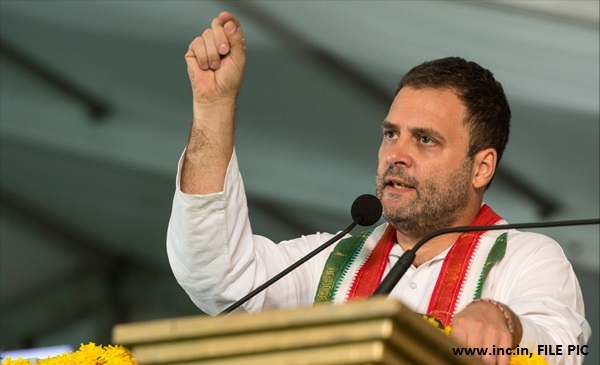 This is not the first time speculations have arose about Rahul Gandhi’s love life with several link-ups being attributed by gossip columns that were never confirmed either by Gandhi himself or the party. In October, 2017, Gandhi was cornered by professional boxer Vijender Singh at a business conference, who asked him about his plans to get married.